360 Slew Telehandler Training – BAM Construction Training’s CPCS A77 Telehandler 360 slew training course (3 or 5 day foundation) is designed to provide novice and intermediate operators with sufficient telehandler 360 slew training which will enable them to competently and safely carry out the role of a 360 telehandler operator and pass the CPCS theory/practical assessments. 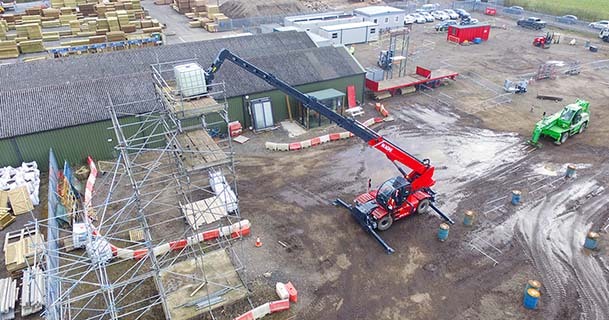 We also offer a 1 day CPCS A77 Telehandler 360 Slew Transitional Assessment (A89) for candidates who need to convert their existing (retired) A17D tickets to the new A77 Telehandler 360 Slew category. You must hold CPCS A17D Telehandler (inc 360 Slew) to be eligible for this option. Candidates attending our CPCS A77 Telehandler 360 Slew or CPCS A77 Transitional Assessment (A89) courses will be trained and tested on our brand new Magni RTH 6.30 SH. This innovative machine boasts a range of features including a very intuitive and user friendly touch screen display which is used to manage the whole machine. Specifications and load charts can be downloaded here. We also have a selection of videos for CPCS A17 Telehandler training which are applicable to parts of the 360 Slew Telehandler training course. These videos provide candidates with step by step instructions on how to execute successful activities such as slope work, high lift and stacking / destacking. The full playlist can be found on the BAM Construction Training youtube channel. Manoeuvre in confined spaces. Follow given signals. Configure & set for lifting, loading & transferring duties. Lift & place suspended & fork-mounted loads under blocked, free-on-wheels & pick-and-carry duties. Maintain safe working areas. Attach & remove various attachments, including hoist-rope for the movement of suspended loads. Lift, transfer & place fixed-hook suspended loads upto max extension, at full working height & using full slewing capabilities. Lift & remove various loads up to full extension and working height. Transfer & place loads accurately. Lift, transfer & place hoist-rope suspended loads upto max extension, at full working height & using full slewing capabilities. Travel over level surfaces with & without loads, on rough, undulating ground and inclines. Explain basic principles of the slinging of loads, and incorrect methods for attaching suspended loads. Explain how stability is affected by travelling with extended boom & rotated upper structure. Maintain safe working situations. *Forks* Lift load & place at ground level at an indicated point using full reach (horizontal) of the telehandler. *Hoist Rope* Place load onto the vehicle bed. Lift load at max radius and slew through 200° & land load within 2m of machines max radius. Prepare and set the telehandler for each lift. Fit the relevant attachment. *Forks* Lift load & reverse in a straight line for at least 20m, passing through a restriction at the end of the run. *Hoist Rope* Lift load & simulate a concrete pouring exercise by travelling the load in a straight line (min 6m) and land load at given place. *Forks* Travel up & down the slope, over rough terrain & pass through a chicane. Stop & restart on incline (loaded). *Suspended Loads* Lift & place load at given point below ground level or behind a structure. Create stack at given location. *Hoist Rope* Position machine so that stabiliser footprint is 2m from base of tower & lift load (75% radius), slew 90° & place on tower. *Forks* High lift & retrieve load. Lorry loading & unloading. Stack 3 loads vertically & destack. *Hoist Rope* Lift load from min to max radius in relation to load. Lift load & reverse for 10m and pass through a restriction. Remove the hook / hoist rope & return the machine ready for fork-use. Park the machine & carry out shut-down & securing procedures. Day 1: Theory Training. Days 2-4: Practical Training. Day 5: Theory and Practical Tests. Day 1: Theory Training. Day 2: Practical Training. Day 3: Theory & Practical Tests. 1 day course which includes theory and practical familiarisation training, plus theory and practical tests at the end of the day. Operators must have A17D to be eligible.